LG's V series of flagships gets traditionally announced toward the end of the year and it looks like this time won't be any different. However, unlike previous years where the V10 and V20 had their own events, it seems like the V30 will be unveiled at IFA. The evidence comes in the form of the above "Save the Date" invite sent by LG. 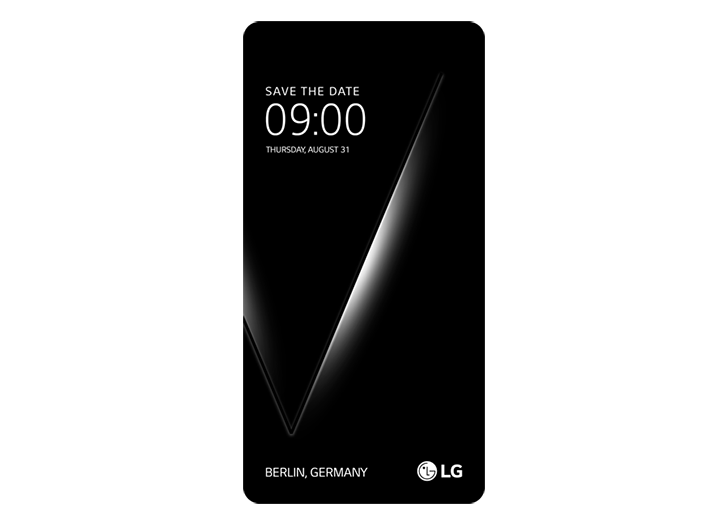 The image portrays a smartphone with rounded corners, the letter V across its screen, a date of August 31 at 9:00 am, and Berlin, Germany as the location. That's the day before IFA officially starts when most companies make their announcements. As for what to expect from the V30, we know for quasi-certain that it'll carry an OLED display, the first on an LG flagship of this caliber. It's unlikely to have the quirky slide-out QWERTY design from these leaked renders, but instead, it is expected to have a more traditional form factor similar to these designs. A dual camera array and fingerprint sensor are rumored on the back, with a display that's at least 5.7" in size. Other potential specs include a Snapdragon 835 SoC, a 3200mAh battery, and IP68 rating. With the date of the announcement fast approaching, we'll probably see more and more leaks and glean more information about the V30. We'll keep our eyes open for those and report back.